While there are many excellent toothbrushes we recommend (see my top electric toothbrushes) which can cost hundreds and not everyone has the budget for that kind of tech. If you want a solid toothbrush that is going to hold up great to repeated use without putting a hole in your wallet, the iBrush SonicWave may be just what you’re looking for. 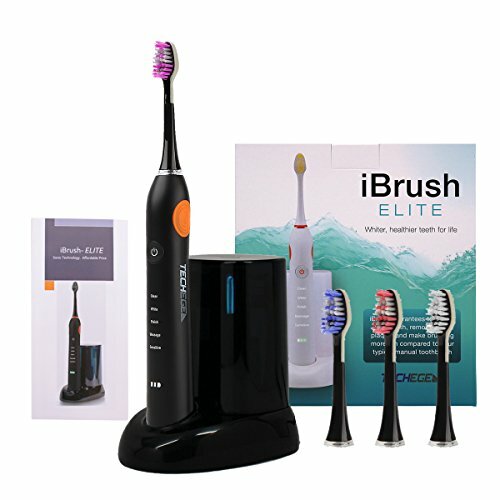 I gave the iBrush SonicWave a try to see if it measured up to the amazing reviews it received online. When I see a brush at a price like this with so many great features listed, I can’t help but wonder if there is a catch. When I got the iBrush SonicWave, it came with everything I needed to get started. I was impressed that I got three brush heads included in the price. Each can last for three months before you need to replace it, so you can easily go the better part of a year before you need to order more. I tested out all three operating modes for the brush. I found that the normal setting was ideal for me, but the soft setting would be perfect for sensitive gums. I recommend using electric toothbrushes with sensitive mouthwash in this case. The massage setting isn’t something I would use a lot, but if you have problematic gums which could use the extra circulation, this would be an excellent feature. While you brush, the QuadSense timer sends a pulse to the handle every 30 seconds, letting you know it is time to move on to the next quadrant of your mouth. This helps you to make sure you are brushing your teeth for the two minutes recommended by dentists. What really impressed me about the iBrush however, perhaps just as much as the brush itself, is the amazing charging dock. Everything about this thing is outstanding. You can use it to store up to three brush heads, so if you have more than one person using the brush, you are all good to go. The dock is water-resistant and safe, and is equipped with UV technology. When you replace the cup after you finish brushing, the UV light sanitizes your brush, killing bacteria. That way it stays hygienic after repeated uses. Failure to keep my other brushes clean has caused them to need replacement well before their time in the past, so I think this will really extend the lifetime of this toothbrush. And when you pay for an electric toothbrush, even at the lower end of the price range, that is really important. What also amazed me about the docking station was how great it is at charging! You can go up to six weeks without having to recharge, according to the company and the reviews. I haven’t reached the six-week period yet, but after four weeks, my toothbrush is still going strong, and that by itself would be sufficient for me to be impressed. This is way better than other toothbrushes I have used that only stayed charged for about a week before I had to charge them again. iBrush charging dock cleans your brush head with a UV Sanitizing Light. Kill up to 99% of harmful bacteria and viruses. The three operating modes are all genuinely useful and make this brush an ideal choice for different types of gums. This brush was actually developed by a real dentist named Dr. Patty Martin. She created this brush for her own practice. If you have a hard time trying to time your brushing, you will find it much easier with the QuadSense pulses. The docking station is just incredible! I love that it is water-resistant and that it includes the UV Sanitizer. Toothbrushes can be so hard to keep clean, and this is so much more effective than rinsing. The six-week charge is amazing too! This accessory alone is way better than the docking stations I have seen for more expensive toothbrushes. The price is unbeatable for the quality you are getting. While this toothbrush includes a ton of awesome features, it is not as powerful as some of the more expensive electric brushes out there, like the Sonicare models. If you need something which delivers a more powerful scrub, you may need to spend more. Some users do not like QuadSense, which actually briefly stops the brush every 30 seconds as part of the “pulse.” Some users prefer a beep so that they can proceed without any interruption. Many of the parts are made out of plastic, and if you prefer something with a more solid feel (including a rubberized grip), you may prefer another toothbrush. The brand is not very well known yet, and there is not a lot of information available if you try to research. These cons are largely subjective and will not matter to many users. Personally, I was not annoyed by any of these detractors, except perhaps the lack of a rubberized grip, which would have been genuinely useful. Otherwise, I was quite happy with the performance of the brush, and I have never minded the QuadSense technology. In terms of power, it packed plenty for me. If none of these potential drawbacks seem like they would deter you, the iBrush SonicWave Electric Toothbrush is a model I highly recommend. You will save money in the cheap electric toothbrushes price bracket, and you will get a great toothbrush which provides you with three useful modes, UV sanitizing technology, and long-lasting performance between charges. What is the Best Electric Toothbrush for Kids? I’m Patricia, a mom to two rambunctious boys who both love candy and just can’t seem to get enough of it. I write about health topics packed with information about dental care designed to help EVERYONE from all walks of life.